Washington, NJ: The new Witte 412-D classifier from process equipment manufacturer The Witte Co., Washington, New Jersey (www.witte.com), has enabled Cirque Du Soleil, MGM Grand, Las Vegas, Nev. to reuse the same sandy beach materials over and over indefinitely rather than discard and replace them after each of more than 500 annual performances of the “KaTM” acrobatic theatrical production. 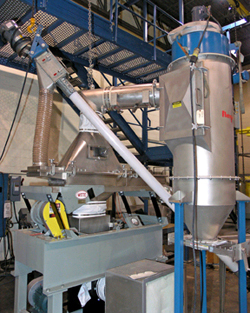 Developed for “The Wash-up on the Shore” scene, which closes leaving thousands of feathery, Tyvek leaves intermingled with 350 cubic feet of the ¼” granular cork particles used to mimic sand, the Witte 412-D air classifier features a 12-inch wide vibrating deck with integrated cyclone, fan and dust collector to separate the leaves from the cork, remove fine cork dust particles and exhaust clean air while readying the beach materials in separate containers in time for the next performance. Installed under the stage, the Witte 412-D accepts the mixture via a screw conveyor as the stage is inclined, dumping the cork and leaf mixture and generating the fine cork dust. The Witte classifier, by permitting the materials to be quickly separated and reused, has eliminated the costs for purchasing new cork and leaves along with the disposal costs of landfilling the previously wasted material. “The Witte classifier does such a fine job of removing the leaves and dust from the cork that we call it our ‘magic machine’,” says Scott Stevens, chief carpenter for Cirque Du Soleil. Prior to contacting Witte, Stevens had tested several screening methods without success.